2 Hour Wargames has created a new companion book to their 5150 Star Army - 2nd Tour game. 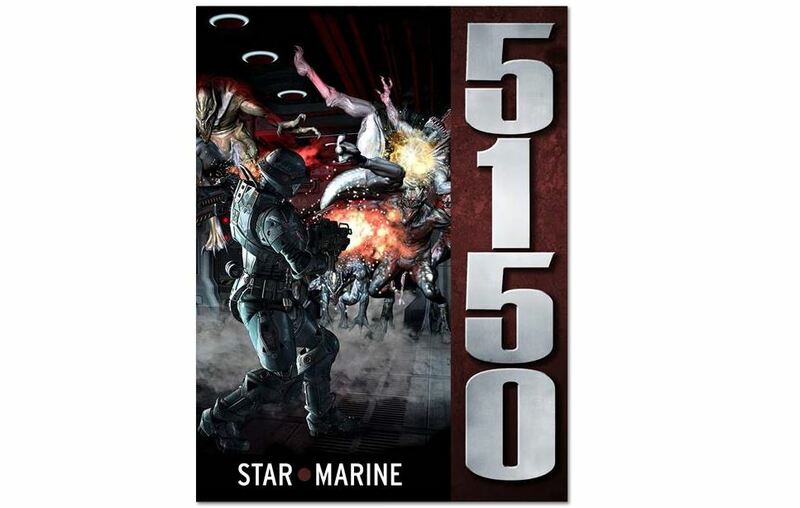 It's 5150 Star Marine and it gives you the chance to play a skirmish game using the same rules. Make your way onto enemy ships during daring boarding actions, conduct raids on enemy camps planetside, and watch out for those aliens. * A man-to-man skirmish combat system that plays fast and yields realistic results. *Introduces rules for Zero-G combat, fighting in zero atmosphere, combat hacking and more. * Eighteen different troop types, a variety of Factions and alien forces, and over 100 pre-generated Non-Player Characters. * Rules to play out your 5150 Star Navy, and 5150 Carrier Command Boarding Actions. * Mechanics to interact with a wide variety of Non-Player Characters that will enhance your Story while on, wait for it… Personal Leave! * A light bookkeeping Campaign System that rewards your Characters when they succeed and punishes them when they fail as well as linking your battles together. * An easy to learn and use combat system that enhances, not inhibits, your games. *Play with any figures you may already have or the color paper counters we’ve included in the game.